Japanese tuners take on a hot version of the British hatchback. DuelL AG has created a new and extensive tuning program for the already hot-to-trot R58 Mini Cooper. The brand-new Mini Cooper Coupe John Cooper Works the Japanese tuners churned out is quite the sight and features plenty of styling to boot. Starting on the exterior, DuelL AG have affixed a solid bodykit complete with a wicked louvered hood, side fenders and skirts, aggressive front bumper with integrated LED lights, redesigned rear bumper with diffuser and a set of racing wheels wrapped in Kumho Ecsta wheels. The Mini Cooper Coupe JCW packs a 1.6-liter turbocharged inline-4 rated at 210bhp. It can sprint from 0-60mph in 6.1 seconds and reach a top speed of 149mph. 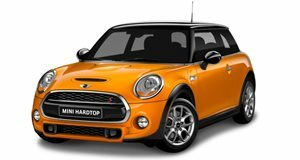 DuelL AG has yet to release pricing for their new kit for the Mini Cooper Coupe JCW. Check out the photos of the intricate program below.